Direct oceanfront Hilton Head Beach Villa with a spacious living area with expansive views of the Atlantic Ocean. Fully Equipped Kitchen with wood cabinetry and all white appliances. Ground level oceanfront family room with patio. Walk right out to the ocean from here. Hilton Head Beach Villa master bedroom with king size bed, flat screen television and private bath on the upper level. Stall shower in Master Bathroom. Guest bedroom a pair of twin size beds, flat screen television and walk in closet. This nicely remodeled bathroom w/shower stall is located off the upstairs bedroom w/2 twin size beds. Lower level 2nd bedroom w/king bed and flat screen television opens out to oceanfront patio. Hilton Head Beach Villa guest bathroom with walk-in shower. The laundry room is located on the entry level of this Oceanfront, 3 bedroom condo. Direct oceanfront Hilton Head Beach Villa. Have your coffee, eat breakfast, have your evening cocktails from this oceanfront balcony. Great place for an oceanfront cook out on the patio. The courtyard area with pool is convenient to each condo at the Beach Villa complex. This pristine pool is located in the courtyard of the Beach Villa complex. Hilton Head Beach Villa swimming pool and beautiful courtyard. Just steps to the ocean on this private path. The boardwalk to the ocean from the Hilton Head Beach Villa Complex. 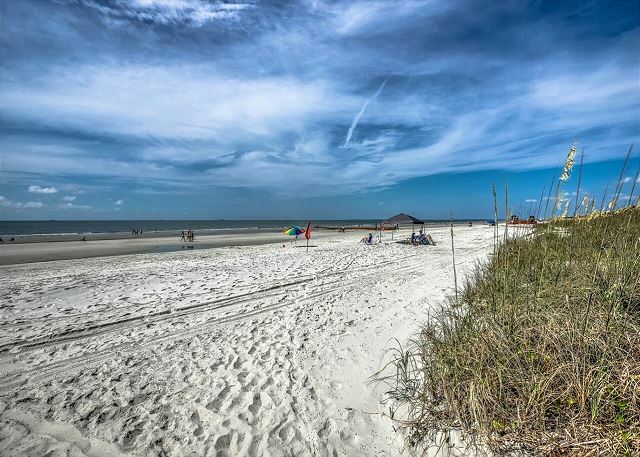 The beach in front of the Hilton Head Beach Villa Complex. Enjoy this breathtaking sunset view from your balcony. 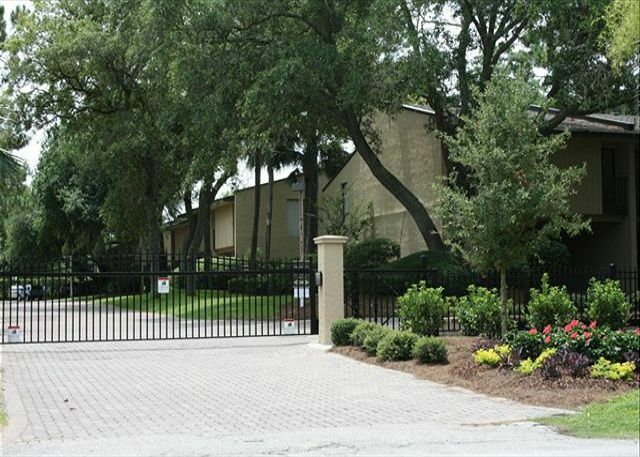 Oceanfront Hilton Head Beach Villa Complex is a private, gated 30 unit community. The oceanfront park has boardwalk access to the beach, benches and swings, and a cabana with restrooms and changing rooms for your convenience. The oceanfront park has boardwalk access to the beach, benches and swings, and a cabana with restrooms and changing rooms for your convenience. The bike trails follow along the boardwalk to give access to the Atlantic Ocean. 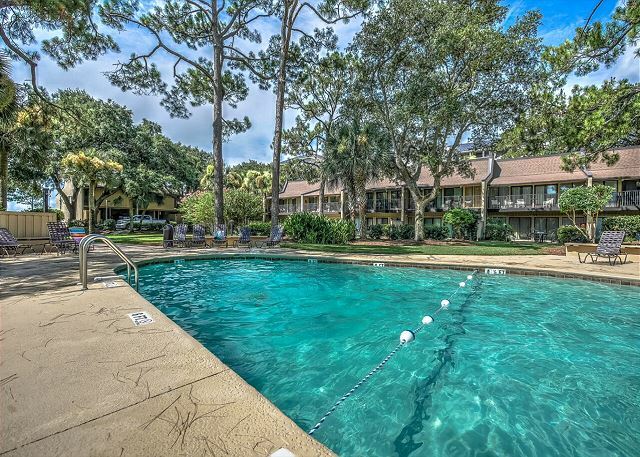 The indoor heated pool of the Player's Club Fitness Center is available for your use with your stay at the Hilton Head Beach Villa Oceanfront Complex. 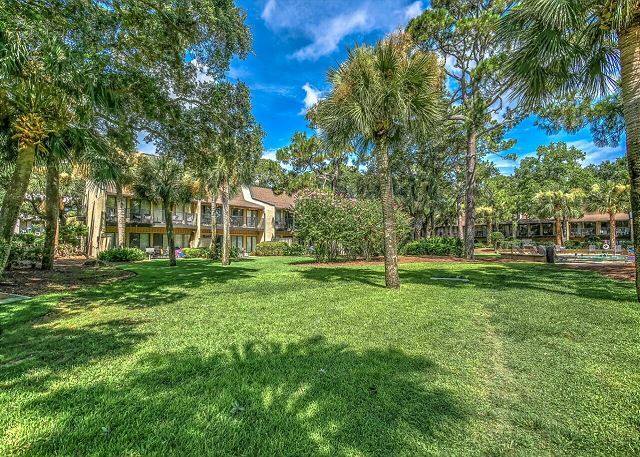 Located oceanfront on South Forest Beach Drive, this tri-level oceanfront town home offers three bedrooms, three bathrooms, and living room-dining room combination, a fully equipped kitchen with dishwasher, laundry room and carport. The living-dining room area has a very large deck and sliding glass doors that offer a panoramic view of the Atlantic Ocean. There is also a second living room that has sliding glass doors opening to a beautiful Oceanside patio. The villa does offer WIRELESS INTERNET and five flat screen TV’s; one if each of the three bedrooms and one in both of the living rooms. Thirty Condominiums share a large central courtyard, pool and children's wading pool area that opens onto the ocean. Add a private patio and barbecue grill off of the first level and you have the makings of a great family vacation. Complimentary health club facility is available. Rooms Sleeps 8, 3 Bedroom, 3 Bath, Oceanfront Hilton Head Beach Villa, beach condo, full kitchen, pool and health club. 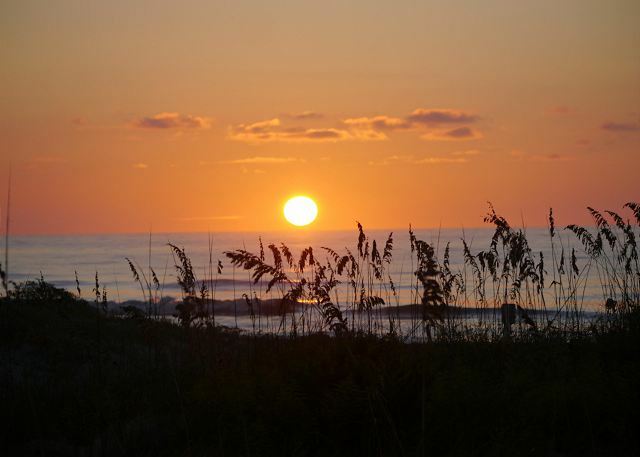 We have stayed at the Hilton Head Beach Villas many times over the years in various units. We love the property grounds, the layout of the villas and its convenient location to other island areas and activities. We particularly enjoy the oceanfront villa #3, especially because of its large oceanfront deck. Our family spends the majority of our beach vacation on the beach and have always found the beach area in front of this property to be enjoyable, easily accessed and not too crowded. The layout of this villa accommodates our extended family, allowing for privacy for all with the bedrooms and bathrooms. As we have stayed at villa #3 several times, and hope to return in the future, our only comment/recommendation would be to update some items (especially the living room couch)which are beginning to show a little too much "age". Great place for a relaxing vacation. Beautiful view of the ocean, nice space for kids to run around, and a short walk on a nice wooden boardwalk to the beach. Close to shopping and bike paths. Perfect for extended family vacation! Perfect location for a winter break....we enjoyed this rental, especially the view and beach proximity. Convenience to Sea Pines and Coligny were also plusses for us. Would definitely return. Lots of space to spread out plus a large area on the main floor to gather together. Very large deck with an amazing view of the ocean. We stayed at this villa in May 2016. The villa is wonderful, absolutely no complaints!! The location is perfect, beautiful beach and walking distance to Coligny Circle. The management staff are very accommodating and helpful. Can't wait to come back! We've been coming to Hilton Head for 35 years. Best place we've ever stayed. We stayed 4th of July weekend and the following week. The accommodations were terrific. The house is a split level style so it affords areas of privacy but the shared kitchen / living room area is just the right size for gathering everyone for a meal. The outdoor decks are wonderful for morning or evening coffee, meals, or just relaxing. The views from the upper deck are absolutely gorgeous! The beach area associated with this complex is relatively uncrowded. The folks at the management company are very nice and attended quickly and efficiently to all of our needs. We enjoyed our stay so much that I have already booked the same unit for next summer. 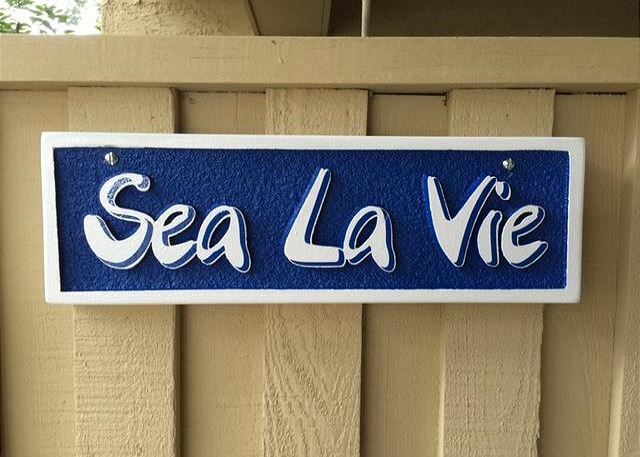 Sea La Vie was a great place to stay! Just a few steps from the beach. Great ocean view with large area for children to play. The patios - upper and lower deck- provided ample room for relaxing and grilling! This was the perfect villa for our family plus it has the most fantastic view of the ocean. The full moon shining on the water at night was spectacular and listening to the waves was so relaxing. The villa was spacious, clean, well layed out and well equipped. There were 6 adults in our group and at no time did we feel cramped. It is located in a great area close to bike trails, stores and most important the beach. I would highly recommend this villa to anyone. wonderful week in a fabulous villa! We had such a great time at our stay at this beach villa. All the amenities we needed, and lovely accommodations! wonderful! A great place! It has Everything you need. Nice sea view! We had a great time! Beautiful sunrises, biking on the beach, enjoying nature. Wonderful experience in Hilton Head Island. A nature lovers Utopia. Beach Villas is located in a great section of the island. We biked to coffee, biked to and on the beach, biked to lunch, market, nails etc in a safe, lovely environment. We were treated to alligators, shore birds, and turtles regularly. The staff at vacation time are the best. We've been dealing with them for 20 years and the excellent customer service keeps us coming back. Yes the property is beautiful but the folks bend over backwards to make you feel at home!! This is a wonderful condo in a great location. This was the second year we were able to stay for 4 weeks and hope to be able to do it again next year. We are hopeful that the green growth between the beachfront condos and the beach will not be allowed to grow so high as to obstruct the view of he ocean. 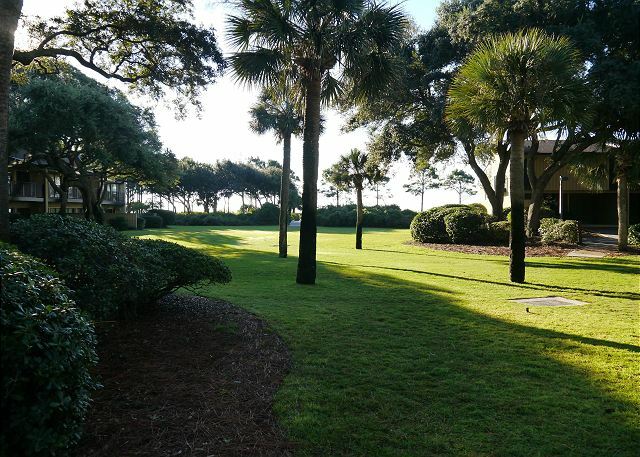 The property is a terrific location on HHI with a beautiful view of the dunes and the relaxing sound of the Atlantic Ocean. The unit has easy access to the beach and pool. BV3 is a wonderful spacious property with cozy comfortable furnishings and is well suited for an active family. it was wonderful . the place we stayed at was so nice , this was our sixth time there .the people that take care of the everything from reservations to care for the grounds do such a wonderful job. we are going back next year. The layout of this condo made our vacation stay perfect for our family six! We definitely enjoyed the deck and the beautiful ocean views. The short bike ride to Coligny Plaza was perfect for dining, ice cream, or picking up a few groceries. We loved the pool and the wonderful childrens pool! The convenience to the beach was a plus with two little ones! We will definitely return for another wonderful stay in your condo! This was a second stay at this beach villa. We love the 's ocean front so you have a beautiful view of the ocean and can hear the waves off the deck. It's also a short walk to Coligny Plaza. It's far enough away from Coligny that there aren't a lot of people on the beach in front of the private beach access. My only complaint is the mattress in the upstairs master bedroom is harder than the one downstairs. It could use a soft mattress pad. We loved our stay and will be back next year. We're glad you enjoyed your stay and look forward to you vacationing with us again!! In regards to the upstairs mattress in the master bedroom being too hard; I did want to let you know that the owner has purchased a nice cushioned pad for that bed. Despite the nasty, cold weather, we had a fabulous time in Hilton Head. Wonderful views from our villa and spacious accommodations. we have been coming to Hilton Head for over ten years and we enjoyed this location more than any other location we have stayed at. We have been vacationing in Hilton Head for 34 years, usually staying somewhere on South Forest Beach. This was our first time at HH Beach Villa and we absolutely loved it. Our villa was in a great location and very comfortable. It was perfect for our needs. The only reason I gave it four stars for cleanliness was because the 2 large air vents next to the stairs were very dirty and dusty when we arrived. But it was promptly taken care of by the management company with cleaning and new filters. The management company was great, especially Stephanie. They took care of any needs promptly. Very professional, efficient and friendly. We loved the villa and the location and hope to return again next year. We would definitely recommend this property to anyone. The Villa is in a fantastic location with beautiful views of the ocean. Walking/biking distance to Coligny Circle, beautiful beach and grounds. Can't wait to return. VTHHI was easy to work with and very accomodating. WE HAVE BEEN THERE MANY TIMES ,AND WE LOVE IT .WE HOPE TO BE COMING BACK NEXT YEAR . We have been coming to Hilton Head since around 1993 and have rented from Vacation Time (Formally Adventure Inn) for YEARS and stayed in at least 3 different properties. We think it is a good value and good location. A good stay. Minor problems with 1 toilet but not a big deal. I LOVED the location of the rental. It has a great view of the ocean and is just a short walk away from the beach. The beach was wasn't crowded at all where our beach access was. The villa was also a short walk to Coligny Plaza. We look forward to returning next year! We enjoyed our stay in Hilton Head Island a great deal. The location of our beach villa was fantastic. We rented bikes for the month and enjoyed biking on the beach or on the bike paths on a daily basis. We barely used our car because our condo was within safe biking distance to everywhere. The condo was spacious and well laid out. There were ample dishes and cookware. There were a few items that were broken and the management company attempted to fix them promptly. The Management staff was extremely helpful, pleasant, and courteous. We enjoyed our stay a great deal. I will rent here again. WE HAD THE MOST WONDERFUL TIME . THE PLACE WAS BEAUTIFUL . EVERY ONE WAS SO NICE AND HELPFUL . FROM THE FIRST PHONE CALL I NEW WE WERE IN GOOD HANDS. IT WAS A GREAT VACATION . Have rented here for many years and have always enjoyed it. The villas are comfortable and well-located, and the management company is friendly and very helpful. Everything about this villa and it's location is wonderful. We couldn't have been happier with VTHHI or the villa. The location, the beach and the views are spectacular. Can't wait to come back next year! Over all everything was great. One of the ceiling lights in master bath was covered with black plastic. There is no better way to start your day than coming down the stairs with a view of the ocean. Beautiful villa, clean, fantastic location ~ thus the reason we continue returning year after year! Hilton head beach villas are a great location. Loved being right on the ocean side. It's quiet and private. Beautiful place, and we loved the ocean view off the main balcony. Everything was clean,well furnished, the condo was well laid out, and the kitchen very well equipped. Three bedrooms and bathrooms were great for our crowd of 6 adults (and one baby)- no waiting in line for a bathroom! The beach was very nice, and while this general area of Hilton Head seems quite busy, inside this condo complex it is very quiet. We enjoyed our stay! Beautiful villa and perfect location! We could not have asked for more! Have used your service several times and before when it was Adventure Inn and have been very happy. When I got there this time to pay the balance due with a seldom used Credit Union Visa, it was declined. No one to talk to about it on saturday and your staff allowed me to wait till monday. When I talked to the Credit Union found out there was a $1K limit that I had been unaware of and they lifted that and the bill was taken care of. With weary travelers including 3 children, that was really appreciated. I love this place. I hope that my comments are helpful. When we arrived the carpet had just been cleaned and was still wet. On the plus side it was clean. The sheets especially on the kingsize bed need to be replaced with thicker new sheets. The ones we had were thin, almost like cheesecloth. On the plus side all the bedding including the mattress pad looked clean and freshly washed. I did not complain because this seemed minor, but it would be an easy improvement for you. I would recommend this property to a friend, but very few could afford it. You could not find a better property manager. Such a beautiful beach villa! We loved the spaciousness and all the extras. We were extremely comfortable - felt like home away from home. The management was friendly and helpful as always. We've always had wonderful vacations with the Vacation Time properties. Nothing but highest accolades from our family. Great Hilton head Beach Vacation! This our third trip to Hilton Head Island and we always stay at the Hilton Head Beach Vills. The villa is very spacious and the oceanfront location is the best. We spent alot of time at the beach, relaxing around the pool and biking on the new bike paths. What a great getaway.